Healthy, fast and oh-so-delicious, seafood makes the perfect ingredient for your midweek family table. 1) Tip the prawns into a large bowl and mix with the garlic, ginger, coconut cream and lime zest. Cover and marinate for an hour. 2) Cook the rice according to the packet instructions. 3) Heat the olive oil in a large pan, add the prawns and fry, tossing regularly, until they are pink and cooked through. Squeeze over the lime juice and remove from the heat. 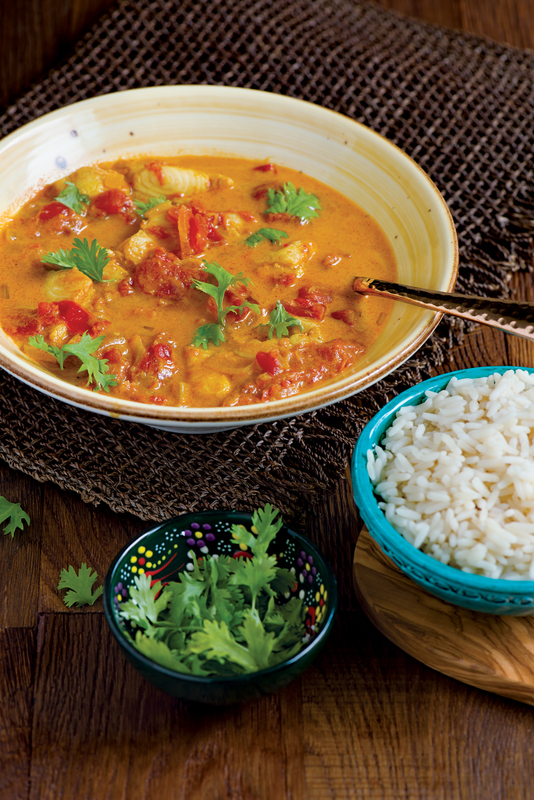 4) Mix the chopped herbs through the cooked rice and divide between four serving plates. 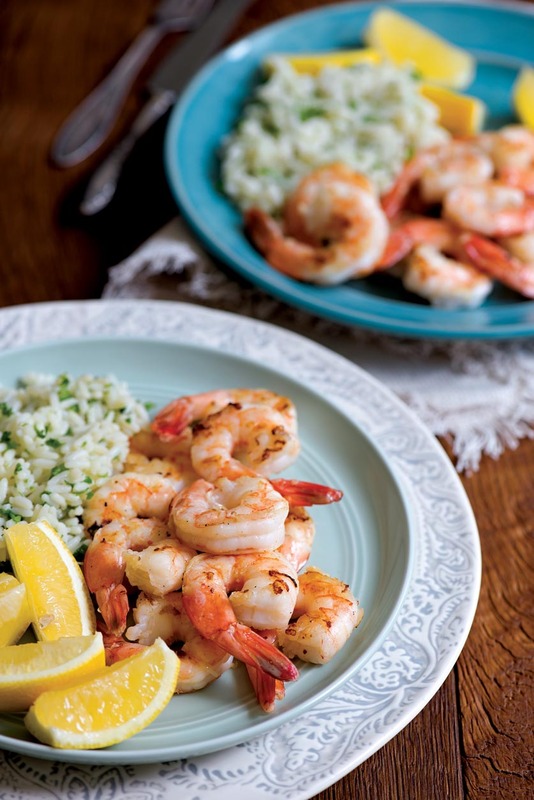 Serve alongside the hot prawns, with wedges of lemon or lime on the side. 1) Cook the rice according to the packet instructions. 2) Meanwhile, in a small bowl, combine the soy sauce, rice vinegar and sesame oil and set aside. 3) Steam the pok choi for two to three minutes. 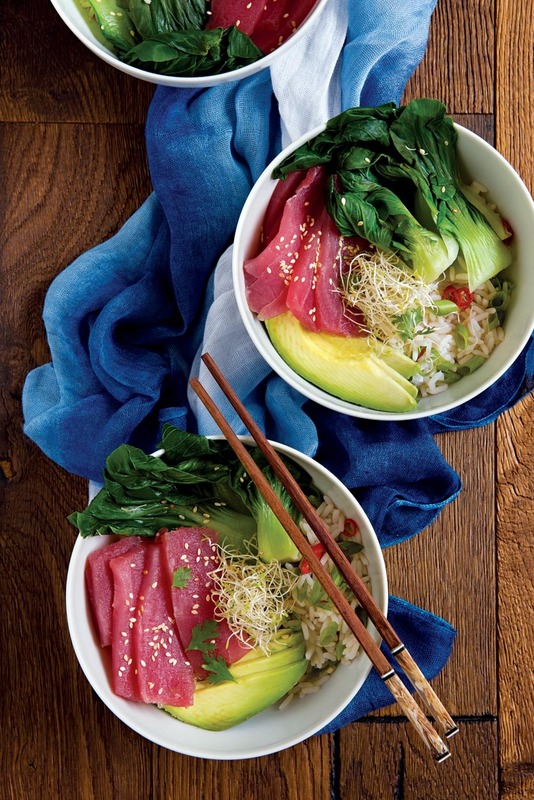 4) Divide the cooked rice between four small serving bowls, then arrange the tuna, sliced avocado and pok choi on top. 5) Drizzle the dressing over the bowls, sprinkle with the alfalfa sprouts, sesame seeds, chopped chilli, spring onion and coriander leaves, and serve immediately. 1) Heat the olive oil in a large saucepan, add the celery, chilli, garlic and white onion and fry gently until the onion and celery become soft and fragrant. 2) Add the stock and the tinned tomatoes, bring to the boil then reduce the heat and simmer for ten to 15 minutes, until slightly reduced. Season with salt and pepper and add the oregano. 3) In the meantime, cook the pasta in salted water according to the packet instructions. 4) Add the cleaned mussels to the sauce, cover with a lid and cook for five minutes, shaking the pot halfway through. Remove any unopened mussels. 6) Remove the pasta from the heat and drain. Add the butter to the hot pasta, toss and season with salt and pepper. 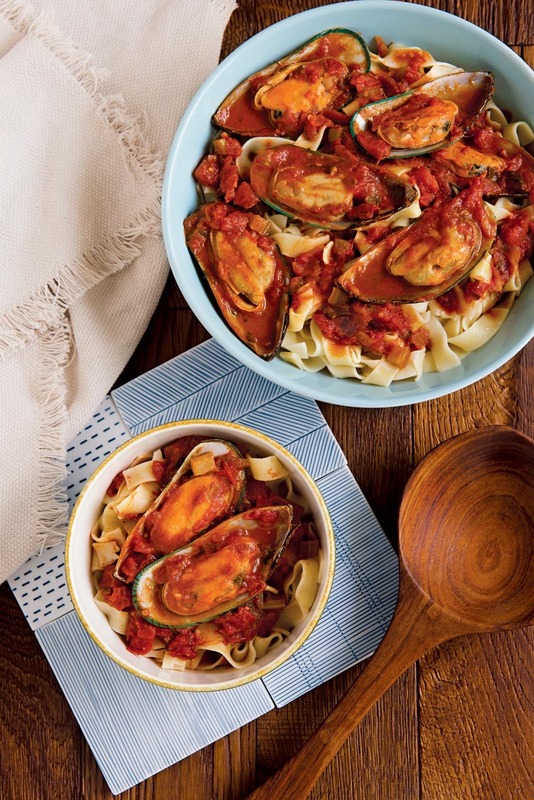 7) Serve the sauce and the mussels on top of the hot pasta. 1) In a small pot, heat four tablespoons of the olive oil. Add the potatoes, celery and chopped onion, then fry until the potatoes are soft inside and crispy outside, tossing frequently to avoid burning. 2) In a saucepan, heat the remaining two tablespoons of olive oil and add the garlic, lemon zest and fennel. Fry gently until soft, then add the calamari and cook for two to three minutes. 3) Add the cream and heat gently for three minutes. Do not boil. 4) Remove from the heat, squeeze over the lemon, mix in most of the parsley, saving some for the garnish, and season to taste with salt and pepper. 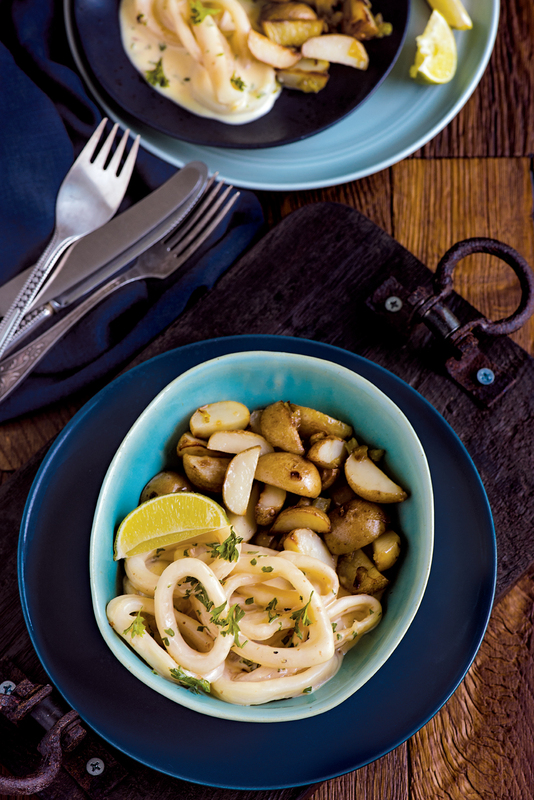 5) Serve the hot calamari with the fried potatoes, garnished with the remaining parsley. 1) Preheat the oven to 180°C. 2) Place the fish on a baking tray, brush with olive oil and lemon juice and sprinkle with salt and pepper. Bake for ten minutes until the fish is cooked and flakes easily. 3) In a small bowl, mix the Thai sweet chilli sauce, water, rice vinegar and soy sauce, season with salt and pepper and set aside. 4) In a large serving bowl, combine the cucumbers and sauce. 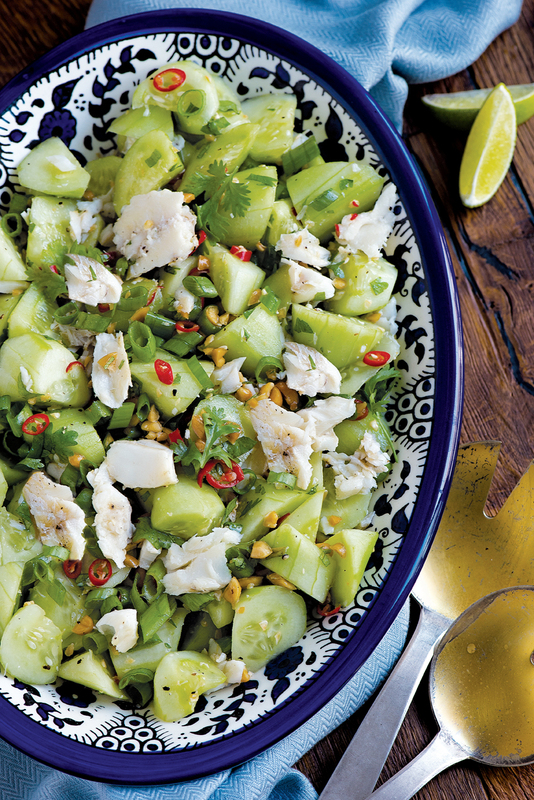 4) Sprinkle over the flaked fish, chopped chilli, chopped spring onion, coriander and peanuts and serve.